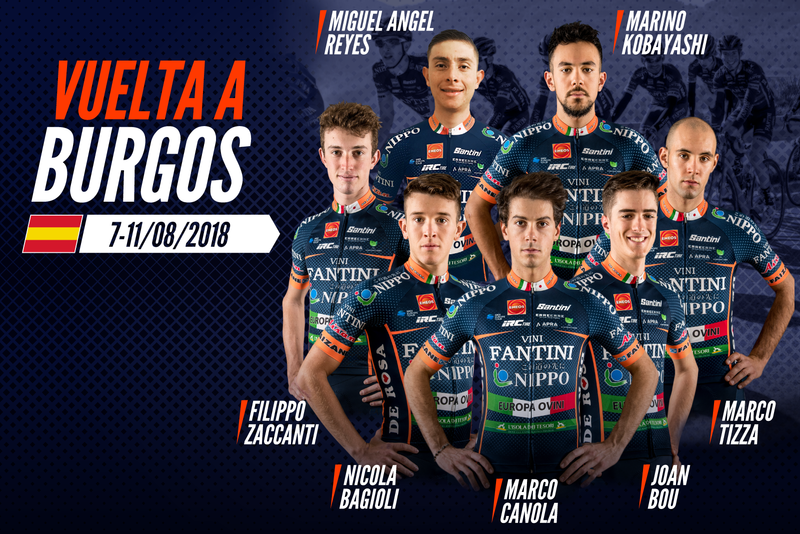 NIPPO VINI FANTINI EUROPA OVINI: 7 #ORANGEBLUE RIDERS FOR THE VUELTA A BURGOS. While 6 #OrangeBlue riders are in America for the Tour of Utah, a team of 7 riders, led by the sports director Valerio Tebaldi, is preparing for the Vuelta a Burgos, the prestigious stage race of the 2.HC category that precedes the Vuelta of Spain. At the start the leader Marco Canola, together with Nicola Bagioli and Marco Tizza and the young climber Filippo Zaccanti. Marino Kobayashi, for the dangerous actions of the day, and Joan Bou, who returns to ride on his streets, complete the roster the stagiaire Miguel Angel Reyes. A week of international competitions for the #OrangeBlue team that, after finishing the important training of Livigno, officially entered in the second part of its season. While a formation will be engaged in the Tour of Utah, from 7 to 11 August the leader Marco Canola leads his on the Spanish roads of the Vuelta a Burgos, hunting for important results. Race with a particular flavor for the young climber Joan Bou, born and raised in Spain and who started his #OrangeBlue adventure in this race last year and for the Colombian Miguel Angel Reyes, who is preparing to face as a stagiaire the first race with NIPPO Vini Fantini Europa Ovini jersey. 7 #OrangeBlue riders at the Vuelta a Burgos, the Spanish competition with 5 stages, two of which are dedicated to climbers. 5 stages in which the sporting director Valerio Tebaldi will lead the team towards the success of the day. Marco Canola, motivated after the training sessions in Livigno, will be the leader of the #OrangeBlue team. In search of victory, especially in the mixed stages provided by the tour, will be accompanied by the freshness of Marco Tizza and Marino Kobayashi. The young Nicola Bagioli will be the fundamental shoulder of the captain and possible protagonist of numerous actions of the day as well as possible stage winner. For the uphill arrivals they will try to attack and become protagonists Filippo Zaccanti and Joan Bou. The new Colombian stagiaire Miguel Angel Reyescompletes the team and will try to demonstrate all his qualities. On the team car the Sports Director Valerio Tebaldi will lead the #OrangeBlue looking for results in Spain. After having followed the riders during the training camp in Livigno, he comments with these words the important stage race that precedes the Vuelta of Spain: “The Vuelta a Burgos is a very important appointment for the team, in view of the races of the second half of season. We have just finished an intense period of high-altitude training in Livigno and I believe that the riders will benefit from it. Our leader is Marco Canola, motivated to leave his mark in one of the stages. With him Nicola Bagioli, Marco Tizza and Marino Kobayashi, ready to fit into important breakaway and mixed arrivals. For the ascending stages we will have climbers Filippo Zaccanti, Joan Bou and the intern Reyes. The team is motivated to best honor this race “. The Line-up of Vuelta a Burgos: Marco Canola, Nicola Bagioli, Marco Tizza, Marino Kobayashi, Filippo Zaccanti, Joan Bou e Miguel Angel Reyes.